Classified as an external combustion engine, a Stirling engine is one that runs off an external heat source. The Stirling engine was conceived in 1816 by Scottish engineer, Robert Stirling. If you look it up on Wikipedia, you will see that these engines use an external heat source and require a cooler source to expel waste heat. If you actually had to build one as a science project as we did, you likely discovered that it could run a small fan from the heat of your hand. 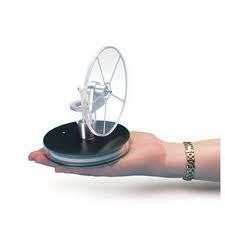 This picture shows a Stirling engine you can get from 3B Scientific that does exactly that. Are Stirling engines practical for data centers? So, you have to think: We have hot air out of the back of the servers and a cooling source (usually chill water or cooling water). We could use Stirling engines to power fans to move air through a heat exchanger. Imagine if your data center used nothing more than waste heat to move the air in it. How much could you save? The Stirling engine could also be used to assist in the movement of cooling water to and from heat exchangers and towers or other heat sinks. The interesting thing about Stirling engines is that they can be very efficient, simple, and easy to maintain. So why aren’t we seeing them in use in data centers? I’ve have always wanted to design a data center infrastructure that included Stirling engines. I think they could push PUEs closer to the holy grail of 1.00, but I’ll leave it to the groups to opine on the merits of this little engineering marvel and its possible applications.